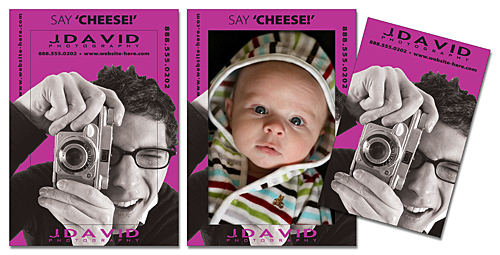 These all important custom imprinted giveaways show consistency in your branding and are intended to put your name if front of your client even when your not. From a pen to a flying disk, from a paper weight to post-it note pads, we can get it all. Each client has a specific need and we will tailor your giveaways to get you the most exposure and make the best impression. We are an ASI (Advertising Specialties Institute) member and have access to thousands of ad specialty manufacturers and millions of unique products. We also specialize in small quantities to make small business look as big as big business. We'll even do it without breaking your budget. 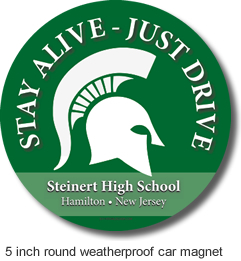 We manufacture some specialty items in-house such as buttons, magnets and the custom candy wrapper shown below. 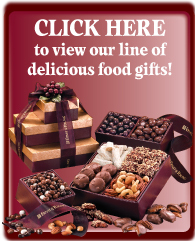 Please contact Kraml Design for your next ad specialty or corporate gift purchase. If you're out of ideas, let us do the research for you. Put your name on it. 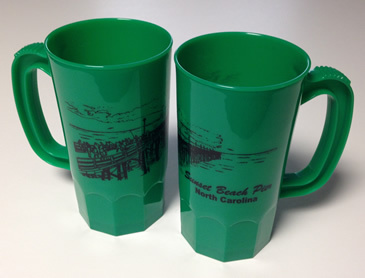 Custom imprinted advertising specialty items are a great way to advertise and give gifts to existing or potential clients. There are millions of options out there. Be sure to choose wisely. Kraml Design can help identify the BEST options to fit your audience and budget. We'll suggest items that are desirable and that will keep your name in the spot light, not in the bottom of a drawer or worse in the trash. Remember, quality design and the right product will get you noticed. We make 1.25, 2.25" and 3" custom personalized buttons in-house! You may order as few as ONE button. They can be made with a variety of backs including: pin, magnet, mirror, foam adhesive and spinners. We can also make them into key chains. Our client, Sunset Beach Pier in North Carolina does! Click on the image below to enlarge. 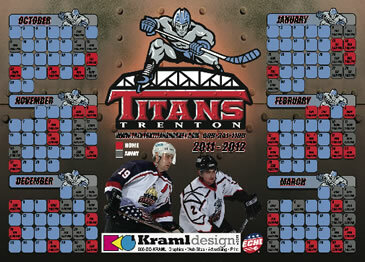 Kraml Design was a Proud Sponsor (and fan) of the Trenton Titans and the Trenton Devils. Hopefully we'll see it return to the area for future generations to enjoy. 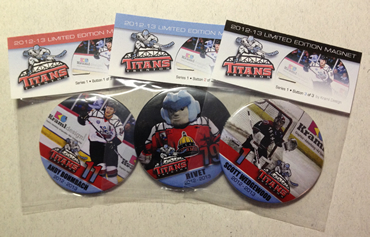 These 3 limited edition 3" magnets above were distributed to Titans fans during the 2012-2013 season compliments of Kraml Design. These were designed, produced and packaged in-house. 100% made in the USA! 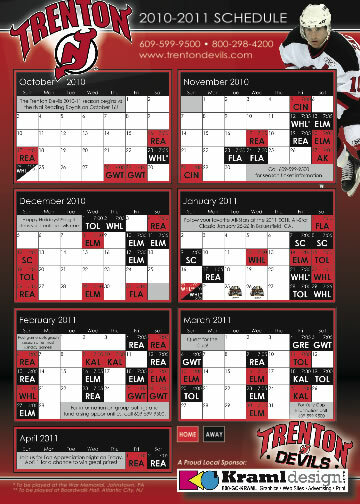 Here's the magnetic schedule we designed and produced for the 2011-2012 season. Need Tickets? 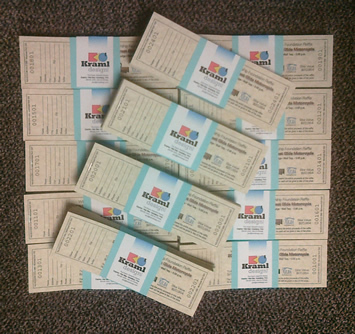 We make custom designed and numbered tickets for raffles & events. Magnetic photo frames make a statement that sticks around. designed and produced for the Trenton Devils.